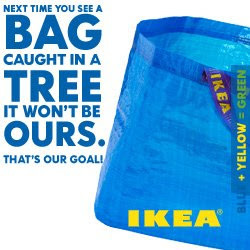 Apparently ikea decided to trick everyone into "going green" by eliminating plastic shopping bags last year (and their production costs) - then got applauded for being cheap bastards! These days a customer's only options are buying canvas ikea bags for .59, bringing their own or hugging everything on the car trek. Doesn't this discourage impulse buying? If I were on my way to a fabulous desk I wouldn't stop for glasses along the way. I'm clumsy and live on a hill - I need plastic bags, paper wrapping and bubble wrap if possible! Plus think of the psychology of grocery stores - they give you huge carts so you can safely drag stuff around and continue tossing stuff in there without thinking of how to get it home. People in self-checkout lanes leave behind more goods than standard lanes because they're standing around looking at their stuff and have time to change their mind. What will ikea do next? Put milk by the front door? So you're officially anti-reusable bags now? Why should we conserve and reduce unnecessary consumption in our own lives if we simply consume ourselves to death as a society? I like the fact that "going green" means companies get to save money and pat themselves on the back at the same time because it means they'll actually want to do it.